In August, Growcom kicked off the first in its series of free workshops under the Fair Farms Initiative in the Northern Territory and in Western Australia. The farm visits and workshops are designed to help growers understand their legal obligations and ensure their workers are treated fairly on farms. Many mango growers attended these sessions. The workshops in Katherine, Darwin and Kununurra were facilitated in partnership with the NT Farmers Association and AMIA. The three workshops were a huge success with 35 attendees participating. The feedback from these workshops was positive with participants showing commitment to improving their workplace practises. An on-farm Hort360 workplace relations assessment was also conducted with a mango grower in Darwin. The detailed information given to this grower highlighted their success in the workplace relations space, but also areas to improve upon. 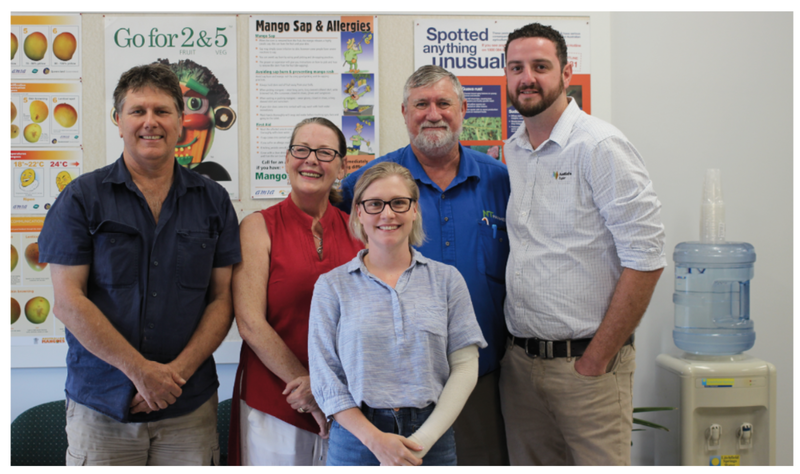 NT Farmers Association president Simon Smith of The Plantsmith Nursery, workplace relations consultant Donna Mogg, NT Farmers IDO Samantha Tocknell, NT Farmers CEO Greg Owens and Anthony Brick of AustSafe Super at the Darwin workshop. Growcom has worked for many years delivering workshops to Queensland growers and was pleased to have the opportunity to take our expertise interstate and work with other industry organisations. In the most recent round of Workplace Essentials workshops we worked with more than 200 growers throughout Queensland, many of whom said it was the best workshop they had attended all year. The professional reputation of our workplace relations staff has been well recognised and we are pleased that Kununurra growers proactively contacted us requesting a workshop in their region when they saw we were coming to the Northern Territory. The Fair Farms Initiative, funded through the Fair Work Ombudsman’s Community Engagement Grants program, is designed to not only ensure growers understand their legal obligations but to lift standards across the sector and develop a ‘beyond compliance mentality’. Across horticulture, the actions of the few are continuing to tarnish the reputation of the many, and we need to ensure good growers are rewarded and bad employers are weeded out. To achieve this, Growcom is working with Freshcare for the remainder of this year to develop a voluntary third party audited certification scheme so growers can demonstrate to their customers they are doing the right thing. The next round of Fair Farms Initiative workshops are expected to take place in early 2018. For further information please contact Growcom on (07) 3620 3844.